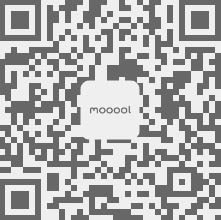 Thanks Rush Wright Associates for authorizing the publication of the project on mooool, Text description provided by Rush Wright Associates. 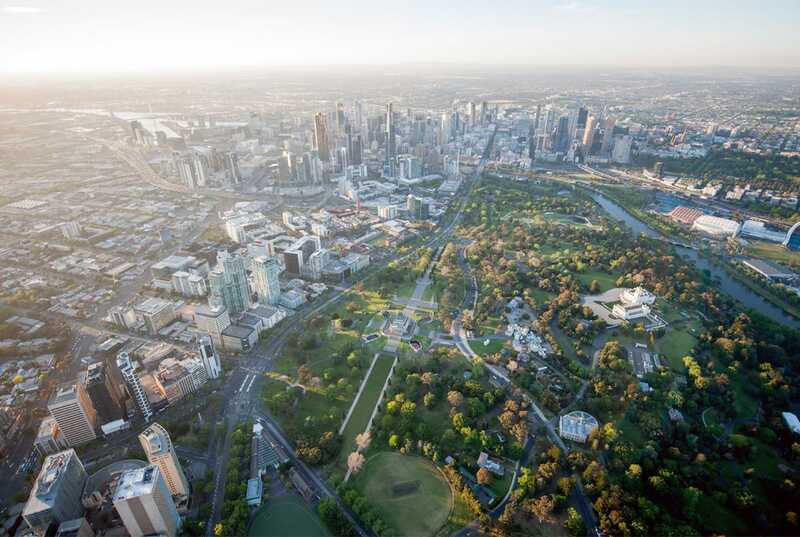 Rush Wright Associates：The Shrine’s prominent location at the southern terminus of the Melbourne CBD commercial axis, and location within the Kings Domain parklands. 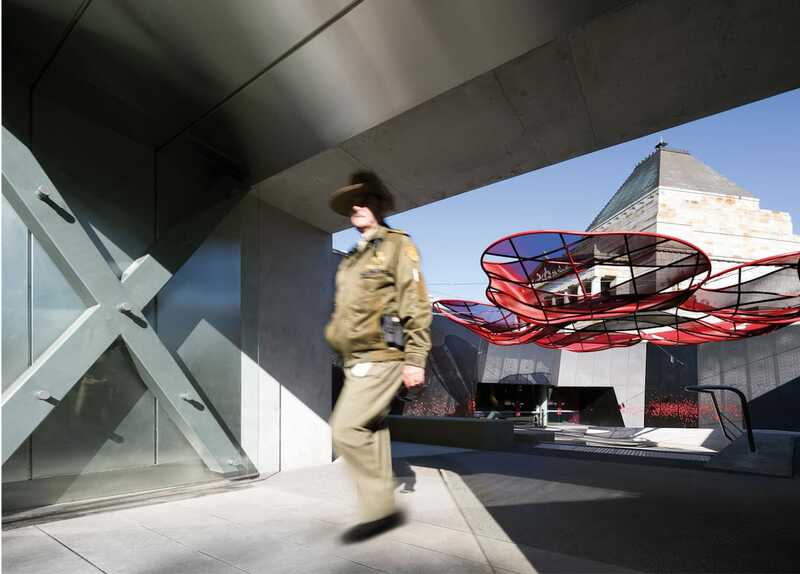 The courtyards are central to the parti of the new project at the Shrine of Remembrance, and are landscape schemas par excellence. Each has a different function and design character, with a particular narrative and design aesthetic. 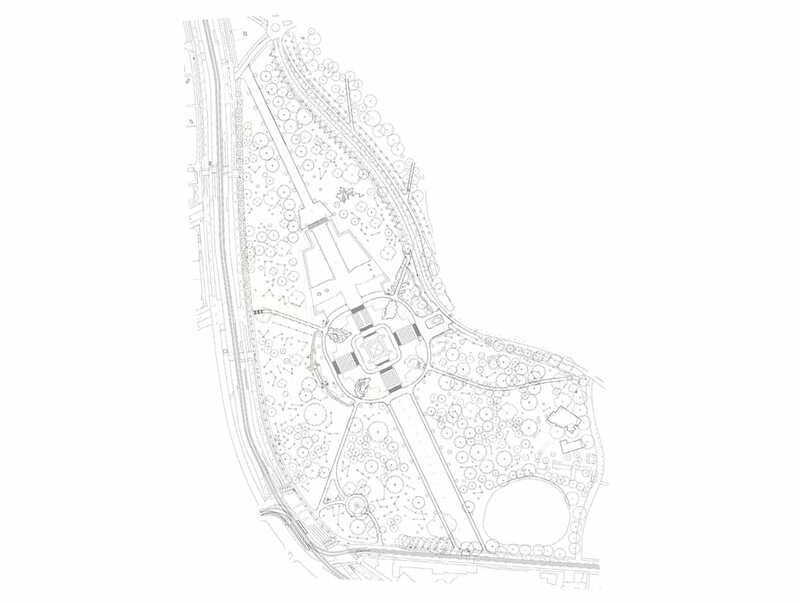 The plan illustrates the courtyard insertions into the Shrine’s artificial terrace. Each court addresses the diagonal pedestrian approaches. The courtyard plan geometry reflects the forms of the slit bunkers which once occupied the reserve during World War 2. 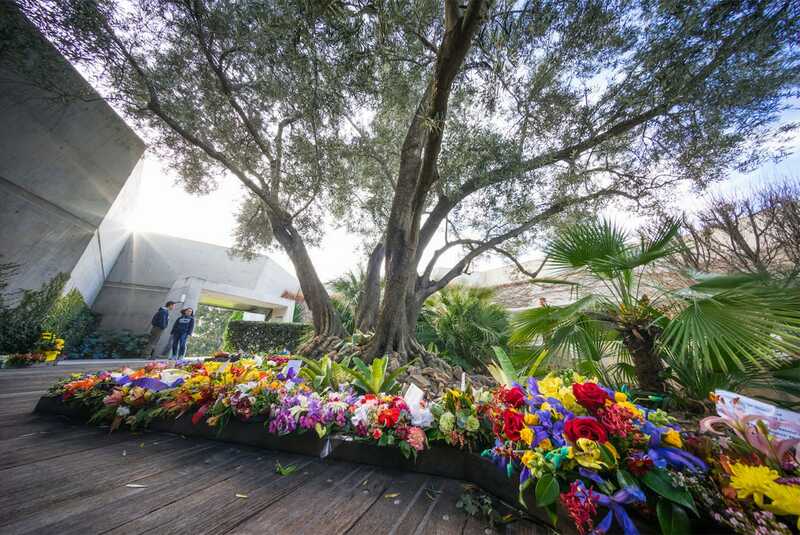 The first move was the transplant preparation and installation of the “legacy” Olive tree, prior to completion of the courtyard walls. Insitu off-form concrete seat walls echo battlement profiles. 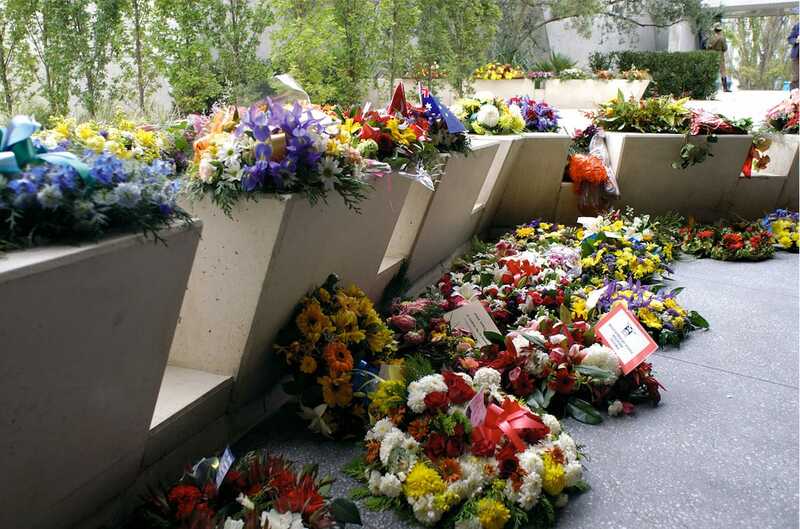 They become places for personal wreath laying during major commemorative events. 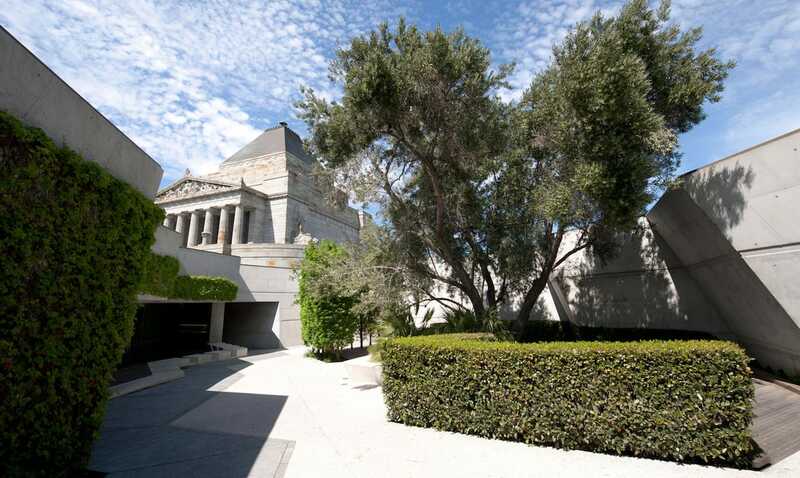 The shadow-line cast by the courtyard wall at the 11th hour of the 11th day of November each year, Armistice Day, aligns with the zig zag Balmoral Green granite line inserted in the courtyard floor. 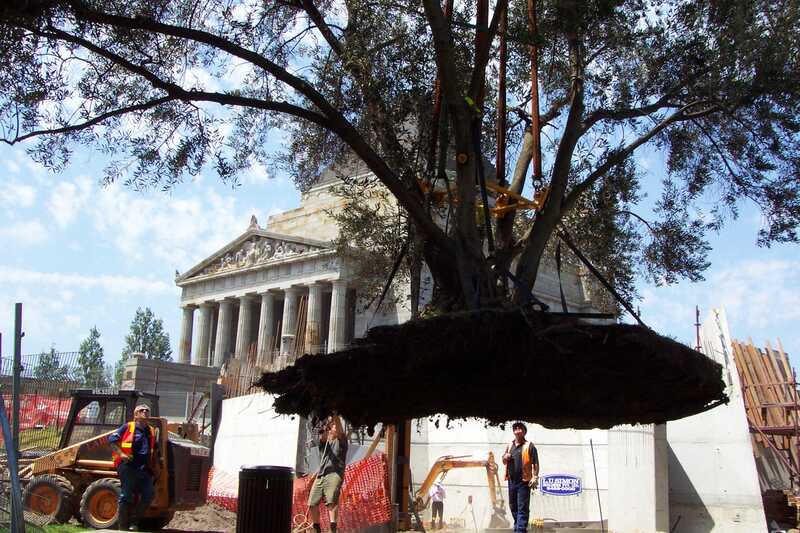 Traditional “temple” plantings of Oak, Olive, Bay Laurel and Fig illustrate the redemptive power of plants to represent peace, longevity, strength, heroism, and remembrance across different cultures. 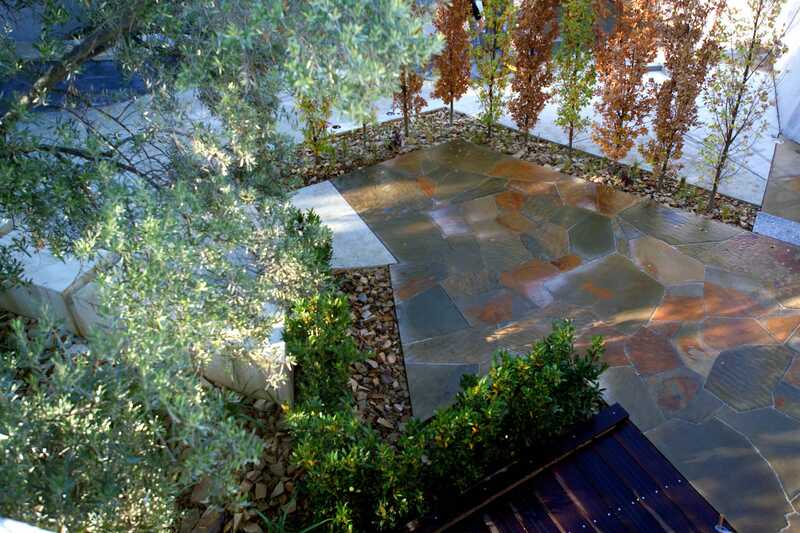 The Courtyard has been designed around the transplanted Olive Tree, and all forms, colours and textures pay due deference to the presence of the tree as the focal point of the design composition. 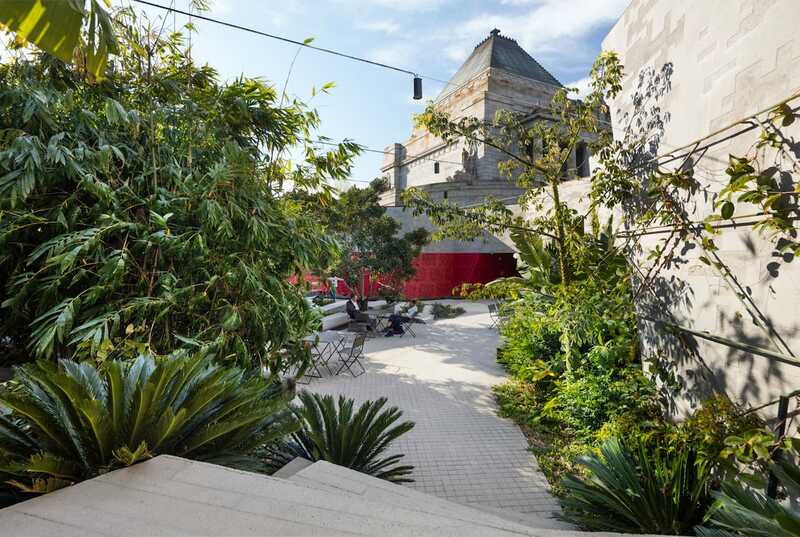 The Jungle Bunker – rough cast insitu concrete walls, terraces and paving set against the luxuriant forms of encroaching tropical vegetation. 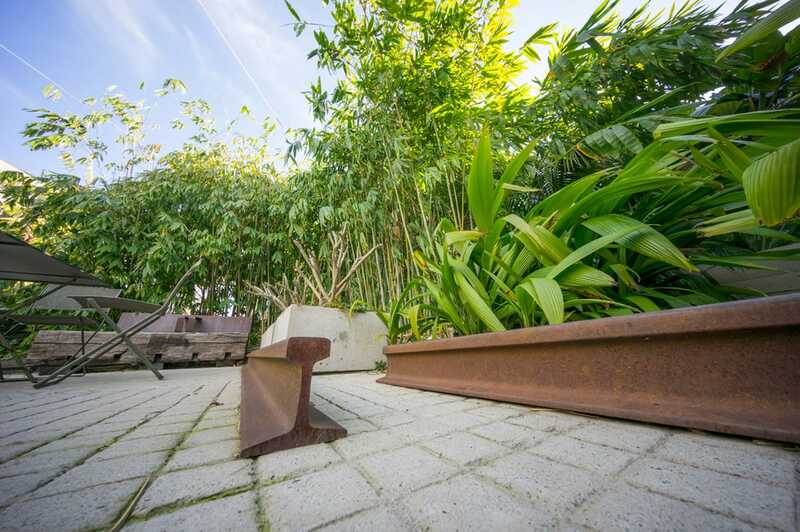 Rusted railway line profiles form edges to planting and seat bases. 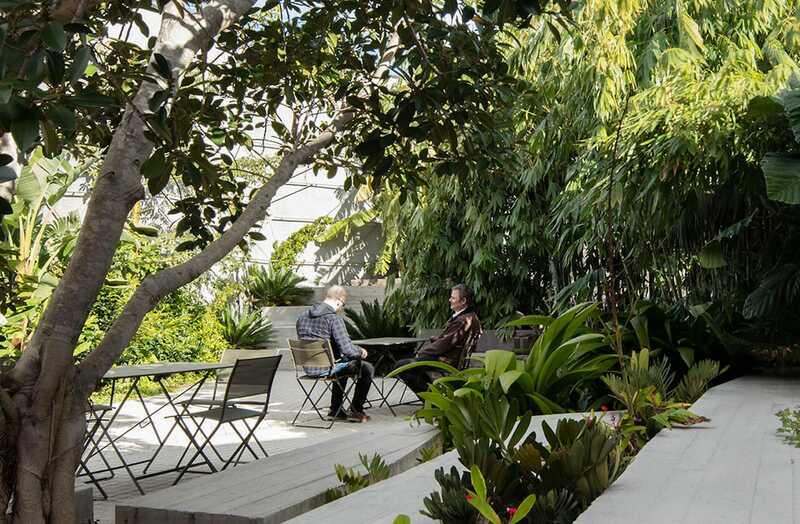 The plinths are recolonised by creeping ground cover, cycad and provide informal seating spaces. Ficus dammaropsis (Highland Breadfruit), a fig from New Guinea, with Solandra maxima (Chalice Vine) holding to the wall trellis. 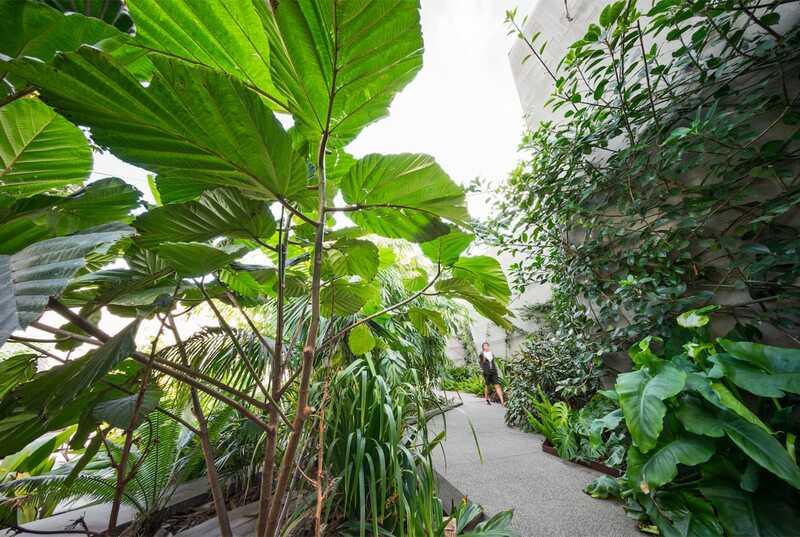 Looking down into the courtyard from the grass terraces above. 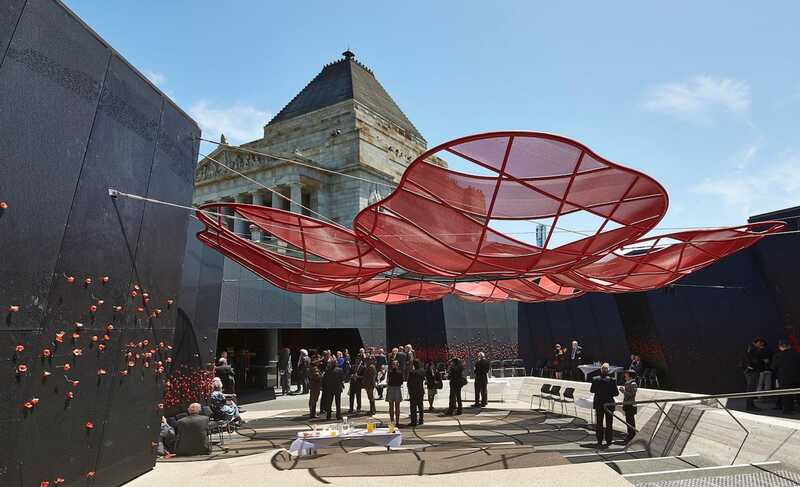 The giant red poppy is suspended and casts shifting shadows across the courtyard floor. The School courtyard gate with one of the Shrine Guides. 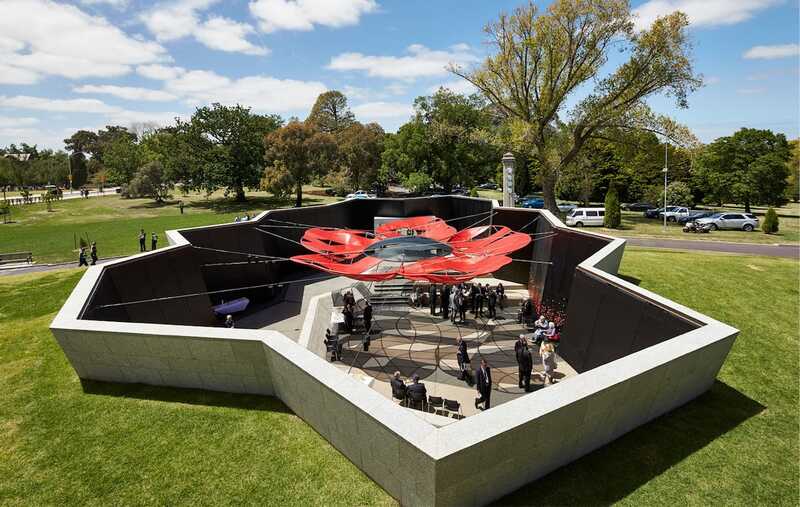 The “poppy canopy” provides shaded space for events, visitor and school group orientation activities and outdoor education. 委托人：The Shrine of Rembrance Trusttees. Clients: The Shrine of Rembrance Trusttees.